What does decreasing marginal product mean? - FreeEconHelp.com, Learning Economics... Solved! Home microeconomics production What does decreasing marginal product mean? What does decreasing marginal product mean? This post goes over the economic intuition of marginal, average, and total product. In economics, factors of production (inputs such as labor/capital) are used to produce goods and services. Economists measure the productivity of a variable input by the amount it can produce and generally call it “product”. 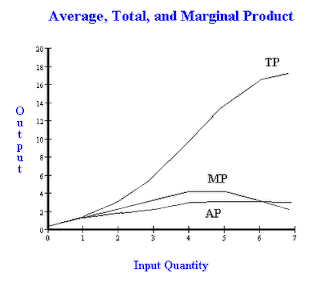 The “total product” is the total amount of output produced with a given amount of inputs, the “average product” is the average amount of output produced per unit of input, and the “marginal product” is the amount of output that the next (or last) input will (or has) produced. Note that the concepts of marginal, average and total products are short run phenomena and long run relationships will be different. In this example, the marginal product is always positive (this doesn’t have to be the case). This means that total product always has a positive slope, and average product is increasing as long as it is below marginal product. In order to get total product we add up the individual marginal products up to that input quantity. To get average product we divide total product by the quantity of inputs. Which of the following apply when marginal product is decreasing? We can see from the table that marginal product is decreasing after the 5th input. Is average product decreasing at this point? Yes and no, average product always CHASES marginal product, and since the marginal product can be decreasing AND still be above average product it is not necessarily true that average product is also decreasing. Does marginal product have to be greater than average product when the marginal product is decreasing? No, we can see from the table that at an input quantity of 7 the marginal product is less than the average product. Is total product decreasing? No, as long as the marginal product is positive, the total product will always be increasing (have a positive slope). Finally, is total product still increasing but at a decreasing rate? Yes, more easily seen in the graph, the total product curve is still rising but has become flatter. This is because we add each marginal product to the total product, and when the marginal product goes down, we add small amounts to the total product. This means that a decreasing marginal product (if still positive) makes total product increase at a decreasing rate. Note that if marginal product is negative and decreasing, total product will be decreasing. The example above is the most common in economics classes and assumes that marginal product is always positive. Leave comments below if you have a class that doesn’t do things this way!